When to use: When you are bearish on the market and uncertain about volatility. You will not be affected by volatility changing. However, if you have an opinion on volatility and that opinion turns out to be correct, one of the other strategies may have greater profit potential and/or less risk. May be traded into from initial short call or long put position to create a stronger bearish position. Profit characteristics: Profit increases as market falls. Profit is based strictly on the difference between the synthetic entry price and the exit price. Loss increases as market rises. Loss is based strictly on the difference between the synthetic entry price and the exit price. This trader feels that Eurodollar prices are going to drop (interest rates to rise). He has no opinion on volatility. 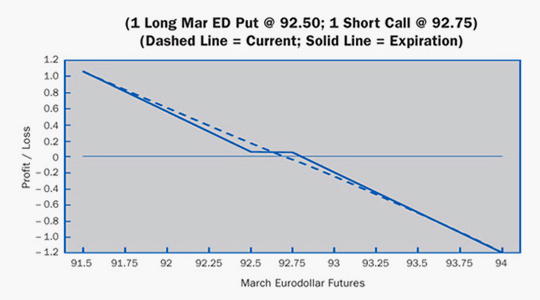 He considers a straight short futures, but decides that there is a slight chance that EuroDollar futures will rise a little. He therefore decides to try a split-strike synthetic short futures position. Loss Risk: Unlimited; losses mount above 92.81 breakeven. Potential Gain: Unlimited; profits increase as futures fall past 92.50 strike. opinion on volatility, he may find another strategy with a better risk/reward profile. Watch this position carefully; just like a short futures, this position has unlimited risk. Check the next page for follow-up strategies.